Hours: The park is open 8:00 a.m. to sunset, 365 days a year. The Education Center is open 9:00 a.m. - 5:00 p.m. Thursday-Monday. Fees: Entrance fees are $2 per person or $3 per car (up to 8 people)--exact change, cash only. 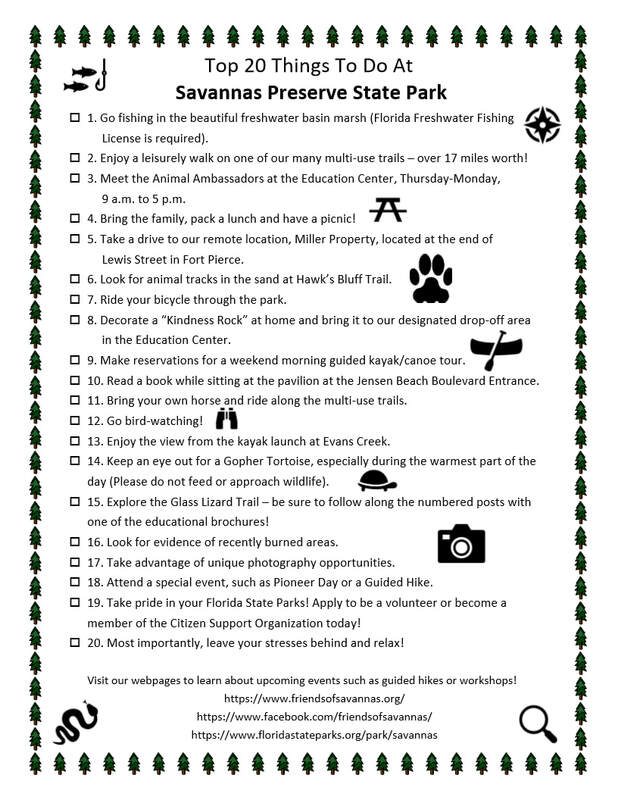 Annual Florida State Parks passes for individuals or families can be purchased at the Education Center. Disabled veterans, with proof of service and service-related disability, are eligible to obtain a free lifetime Florida State Parks pass. From U.S. 1: Go east at the light at Walton Road. Go through two stoplights, and after the four-lane road narrows to two lanes, the park will be on your left just past Scenic Park Drive. From Indian River Drive: Turn west onto Walton Road. The park entrance is on the right after Port St. Lucie Hospital and Green River Parkway. From I-95, northbound: Take exit 118, go east on Gatlin Blvd., north on Port St. Lucie Blvd. (CR 716), cross U.S. 1, left on Lennard Road, right on Walton Road. From I-95, southbound: Take exit 121, go east on St. Lucie West Blvd. which becomes Prima Vista Blvd., turn right on U.S. 1, then turn left on Walton Road.